Last Friday saw the launch of The Digital Einstein Papers. Hosted by Princeton University Press, the web site gives web users free, online access to the The Collected Papers of Albert Einstein. To date, 13 volumes of Einstein's writing (or 7,000 pages from 2,900 documents) have been published, and they all now appear in electronic format on the Digital Einstein site. Eventually, a total of 30,000 documents will get uploaded to the digital collection. The initial trove features, says Princeton University Press, "the writings and correspondence of Albert Einstein (1879-1955) from his youth [through] 1923." 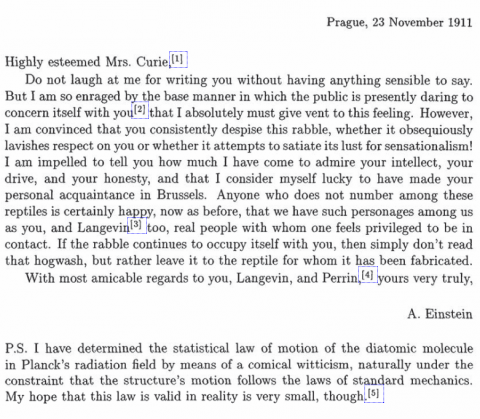 And it includes things like: Einstein’s love letters, the notebook in which he worked out the general theory of relativity, and this gem of a letter (found by Vox) where Einstein counseled Marie Curie on how to deal with the trolls of last century. The texts are all presented in the original language in which they were written. Many have in-depth English language annotations, and generally readers can toggle to an English language translation of the documents. As we noted in 2012, a separate online archive of Einstein's papers lives on a web site hosted by the Hebrew University of Jerusalem. Courses on Einstein can be found in our collection of Free Online Courses, and important texts by Einstein can be downloaded from our Free eBooks collection.